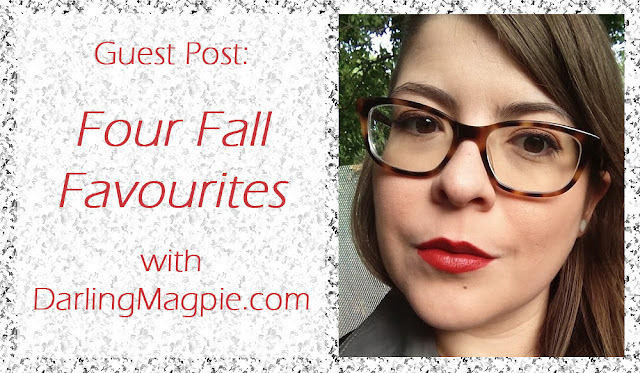 Guest Post | Danielle of Darling Magpie on her Fall favourites! Well, hello Just J readers! I'm interrupting your regularly scheduled program to do a little guest post today as MizzJ takes some time off to get married and do all that fun stuff that goes along with it! 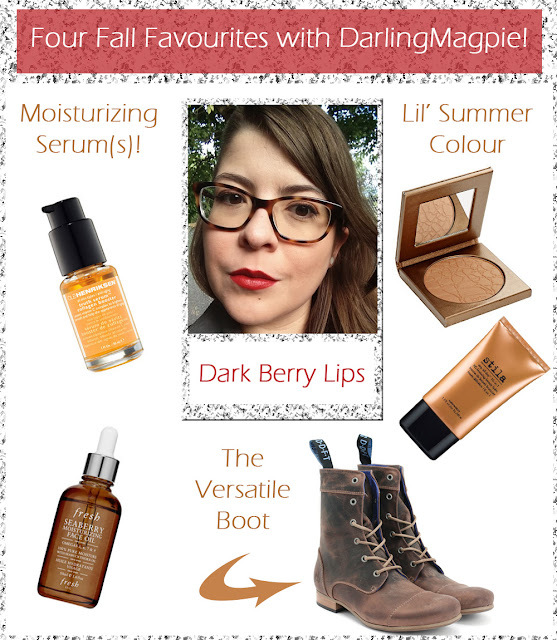 I'm Danielle and you can find me over at DarlingMagpie.com, I'm a beauty blogger from Toronto who is obsessed with nail polish, skincare products and owning all of the lipsticks. All of them. I'm popping over here today to share with you a few of my favourite things for fall. As an avid cyclist, I'm not the biggest fan of summer. I have to bike in workout gear and shower/change at the office, and I DEFINITELY can't put my face on before I bike. Summer cycling isn't pretty. But fall? Fall is my jam. Fall! Never end! You hear me?! Oh ma gawd, what is fall without a dark lip? I practically live in corals and oranges all summer so it's nice to pull out some more striking hues come fall. Currently I'm all over my Bite Beauty Maple Matte lipstick in Braised Maple. I love Bite lipsticks particularly because they are all so moisturizing, give great colour and they are all food-grade, so inevitably when I accidentally eat a bunch of it during lunch, it's all just food anyway. ;) The Maple Matte line is exclusive to Sephora and totally worth the splurge. I'm unfortunately unable to wear heels like everybody else right now due to a foot injury, so instead I'm absolutely L-I-V-I-N-G in my John Fluevog BBC Radio boots. This soft brown leather boot has a wood heel with a rubber sole (so it can be replaced and maintained!) and features a slim, classic look that fits perfectly with a pair of jeans or a cute dress and tights. Also, it has a peekaboo blue interior. Absolutely divine, you can't go wrong! With the advent of fall comes the inevitable weather change. While it's not as bone-suckingly-dry as winter, I do notice my skin gets muuuch more parched come fall. I have a few serums and oils that I alternate through, but my favourites are either Ole Henriksen's Truth Serum Collagen Booster, which uses Vitamin C to help refresh the skin, or Fresh's Seaberry Oil which owes its replenishing powers to sea buckthorn oil (hence, seaberry!). You only need a small dab of either to use pre-moisturizer and it definitely helps keep your skin healthy and radiant despite the drying weather. Now this is going to sound weird. But I don't REALLY wear bronzer or tanner that much in the summer, because I tan naturally quite well for my skin tone. But when fall comes a running, I have to layer it on a bit, because I can get pale FAST. To transition my skin from my quickly-fading summer glow to my paler winter complexion, I usually use a dab or two of Stila's Stay All Day HD Bronzing Beauty Balm in my BB cream or foundation, and brush a SUPER light contour on my face with my Tarte Amazonian Clay Waterproof Bronzer in Park Avenue Princess. And there you have it. My four fall faves that I really can't do without. Sure I could've added cute scarves and leather jackets to the list, but so could ANYONE! Get those too! They're also great fall essentials. What can you not live without during the fall? Comment here and let MizzJ know, or follow me on Twitter @darlingmagpie or visit my blog at Darlingmagpie.com and let me know about your favourite things. Thanks to MizzJ for having me today! Thanks Danielle for now giving me major shopping cravings! I love her tip about using bronzer in the fall - fair skin, not flat, pasty skin is in!